Geronimo! The eleventh incarnation of the legendary Time Lord the Doctor was a man whose youthful appearance and quirky enthusiasm was often at odds with his world weary temperament. Easily bored, the Eleventh Doctor liked nothing more than travelling with his companions Amy Pond and Rory Williams in search of thrills and new adventures. It was at times that his friends were in danger that the Eleventh Doctor would display his often frightening temper and brooding rage but he would always return eventually to his friendly ways. Part of the Collector Series of Doctor Who action figures and exclusive to Toys R Us! Collect them all! Includes a sonic screwdriver accessory. As with the TOTD set I wish the waistcoat was darker as from memory this style of waistcoat was his velvety black looking one, the grey was a different style as seen in JTTCOTT. Still like the purple coat look overall and so wish this had been 11’s look from the get go. He changes his outfit before regenerating. He wore the black velvety one when he was walking around Christmas. The details are very nice and there isn’t a single fault with the articulation. The head is easily removable, however unlike the Time set, the jacket and waistcoat are glued (Although they’re easy to peal of after putting in hot water, incase you want to customise). I can’t say whether this devalues the Time of the Doctor set, but I can’t imagine it would as now you can display pre and post regenerated Doctors from the episode together. Overall, I think it’s a solid 8/10 figure. Doesn’t get the full 10 as it essentially is just a rerelease though, and a bit of a downgrade. But nonetheless a good way to get a great figure cheaper, if you’re not too bothered about the accessories in the Time set! I think they’ve really missed an opportunity for a good variant here without the need for new sculpting. By repainting the waistcoat a brighter grey, shirt a lighter blue/grey and the bow tie burgundy with white dots I made a Hide variant. Now if you repainted the non-bow tie waistcoat in the same colours from the TOTD set then you could have had a great hide variant set with basically no extra sculpting needed just a change in colour! It’s a real shame they didn’t do this I think as it would have been a great seller as a different variant! Well, you’re absolutely right. At least it’s cheap enough now that u can attempt to customize it. Here in the USA, the TOTD set is about the same price as this figure so u might as well by that since u get the extra 12th doctor head and handles. It’s only $23.50. Hey CaptainJimipie, do you have a video up of you doing this repaint variant? If so, you should put a link to it. I did exactly what u said and my figure looks great. has this been put in stock before and did i just miss it or has it not been released yet? okay thanks I just wasn`t sure, I never noticed it had been released I must have missed it when it was first in stock. When do you think it will come in stock next? this came today from toys r us and I think them black stickers covering the underground toys logo on the box really spoils it. Any reason why everything has been reposted? If everything is not in stock yet? Is the jacket glued down and is the head removable? Already got the time of the doctor set. Infact the time of the doctor set is still in stock on forbidden planet. How long would these most likely stay in stock? I haven’t a clue but they seem to be staying in which is surprising, are you looking to buy them? but you can’t buy them at the moment or something? typical already have a toys r us order that I placed on sunday waiting to be dispatched. now im having to pay postage to get this figure as I cant add it to my order. You could wait and get the 8th Doctor’s figure, that’s if you want that figure. That’s what i’ll be doing. already have it on order from forbidden planet and been charged the postage when they sent the clara figure to me. That’s a shame and annoying, I didn’t even know they actually sold that figure in the until the other day. 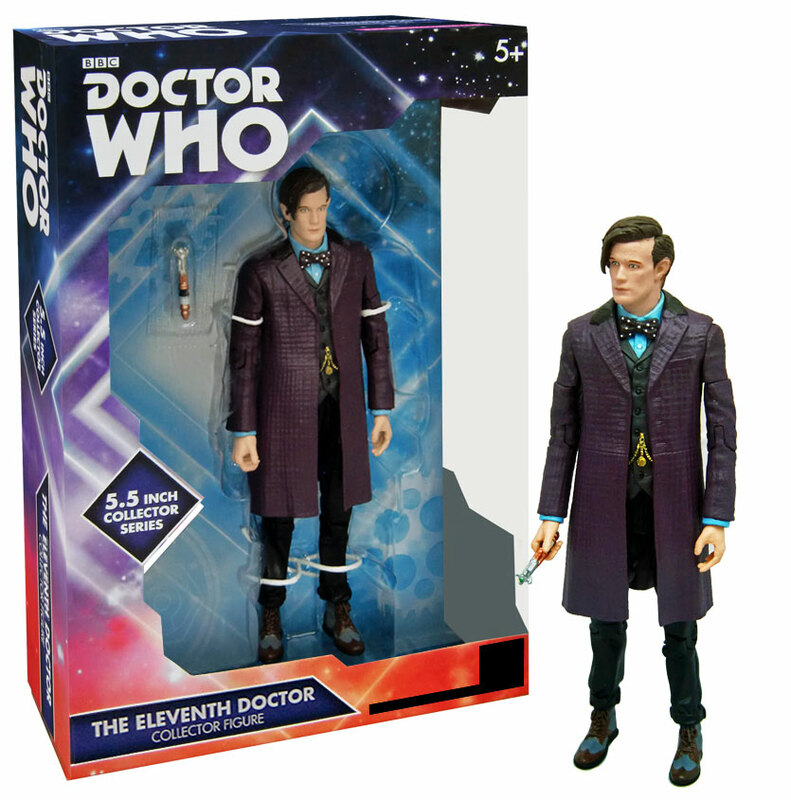 I’m wanting to get this figure and 8th, I just wish the 8th Doctor would come in stock. You could get the Flight Control Tardis with the figure. Then you would end up getting the postage free. Figures crossed for a release tomorrow. There were loads yesterday in the Reading store. None where I live, need them to be put online. It’s rumoured the reason why this and the Amy Pond figure got this style packaging is because they’re the only two figures that actually got changed. Amy got more apparent tights, and the Doctor’s waistcoat is apparently now glued down. I guess it would have cost money to do character-related motifs for each figure. is that the same head sculpt as the time of the dr set?? It looks fine in Hand. Wonder if the waistcoat will be removable. It would be too much trouble for Character to make a figure from scratch. He looks a little lonely without any of his previous accessories (except for Sonic SD), but with around £15 cut off the price, they won’t be missed too much! I’ll probably end up picking this guy up so I can display my TOTD set as regenerated Capaldi. Does anyone know what determines whether ‘classic’ or ‘new series’ logo is used in the new 5′ figures box style packaging? Missy and 8th Doctor have new series logos while the 12th Doctor and Clara have classic logos. I actually like the fact they’re using both but just wondered if there is some logic to it that I’m missing. I think using the current logo indicates something particularly special. The Missy figures being directly sold off Character Online matches how that website sells mainstream items that use the current logo, and the press release talked up the Eighth Doctor figure quite a bit so perhaps it’s meant to indicate a highlight of the line.